Sponsored by Israel’s Ministry of Diaspora Affairs and the Jewish Women’s Renaissance Project, each Momentum trip brings 200 women from all over the world to Israel, where together they travel and learn about the country and Jewish heritage, with a focus on self-transformation and communal involvement. All the women pay for is their airfare; the remainder of the trip is funded by the Israeli Ministry of Diaspora Affairs, JWRP donors and foundations, and a per-woman fee paid by the local partner organizations. JWRP ran 16 trips in 2016. To maintain its community focus, trips are organized by local partners who recruit about 10 women each, provide trip information, and arrange educational follow-up. The mid-November local trip brought together three partners: Princeton Hadassah; L’Dor V’Dor of Central Jersey, which provides Jewish programs and education to the greater Princeton area; and the Shalom Heritage Center of East Windsor, which offers classes and activities for Jews of all backgrounds. For Dr. Jill Schwartz-Chevlin of Princeton Junction — the city leader for this trip, a veteran Momentum participant, and a 20-year Hadassah activist — the venture represented the culmination of her efforts to bring together Hadassah and JWRP. In January 2016, when national Hadassah president Ellen Hershkin of Dix Hills, NY, invited Schwartz-Chevlin — who is also CEO of Princeton Home and Primary Care and medical director of the Renee Denmark Punia Community Hospice of Greenwood House in Ewing — to be national cochair of Hadassah’s Physicians’ Council, she agreed but also requested a meeting about making Hadassah a JWRP partner. Understanding the potential synergy between the two organizations, Hershkin and national Hadassah’s executive director and CEO, Janice Weinman, were able to quickly secure board approval. Two weeks after the July 7 contract signing, Schwartz-Chevlin had filled the 10 slots for the Princeton group. 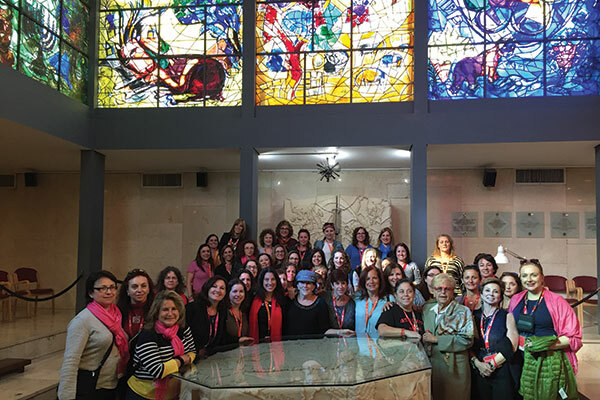 Participants reported being particularly inspired by JWRP founder Lori Palatnik, a Modern Orthodox rebbetzin from Rockville, Md., who was raised in a Conservative synagogue in Toronto and was part of the trip. One of the requirements for Momentum trip participants is that they not be shomer Shabbat. “Even though the roots of the organization are Orthodox, they did not hit us over the head in ways that would have turned some women off,” Wachpress said. She added that although they held no formal Shabbat services, the participants celebrated with singing and dancing, and a rabbi spoke about the beauty of Shabbat and “how it is essential for our survival to have a day where time stops.” Each woman was also given a siddur to commemorate her participation. Due to the new Hadassah partnership, all members of the Princeton group visited the Meir Shfeya Youth Village for troubled youth in Zichron Yaacov. 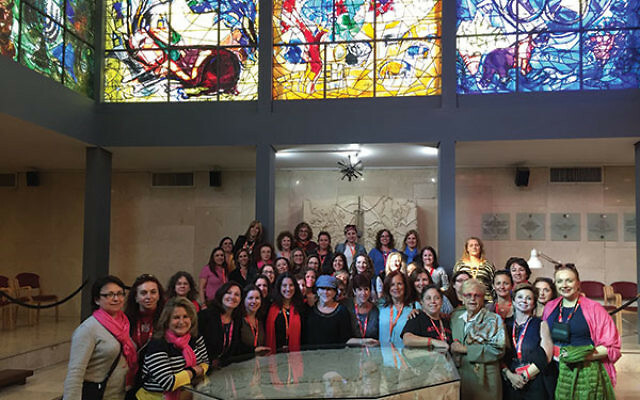 They also toured Hadassah Medical Center in Jerusalem, including its Abbell Synagogue, which houses the famous Marc Chagall windows, and had an opportunity to distribute gifts and make scarves with children who had chronic illnesses in the Charlotte R. Bloomberg Mother and Child Center. For Schwartz-Chevlin, an important moment was learning with a female professor, who handed out a piece on the weekly Torah reading, had the women pair off, and invited them to ask questions about the text — What didn’t make sense? What sounds ridiculous? What alarmed you? “I think this is a piece we really need to cover now,” Schwartz-Chevlin said, noting that women have been encouraged to continue study sessions with Partners in Torah or at Momentum-sponsored learning events (one such event is an upcoming study session with a rabbi on Judaism’s View of the Supernatural: Life after Death, Witchcraft, and Prayer).